What are my rights if I only have an oral rental agreement? - Answer from the MyAttorneyHome FAQ desk. Home › Questions › Contract Law › Renter did not pay rent but there was no written contract what are my rights? Rental agreements are often made by landlords and tenants, allowing for the tenant to occupy a rental home, condo, or apartment for less than a year. Although this most commonly occurs when a tenant has signed an extended lease and instead of signing another lease they simply allow the lease agreement to expire and rent month to month, it can also occur when a tenant simply does not want to sign a full year lease and rents the apartment one month at a time. Do I have to have a written lease agreement? Owners of an apartment complex generally will require some type of written rental agreement simply because it is more enforceable and allows both tenant and owner to document the terms of the lease arrangement, including the rental amount, the rent due date, and whether the tenant can have a pet, etc. Just because you and your tenant decided not to formalize the agreement in writing, however, does not mean that there was not a contractual understanding or that the oral agreement cannot be enforced. 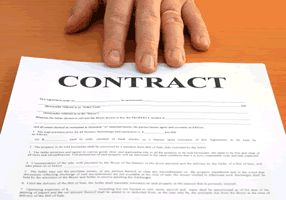 In fact, oral leases for a month to month tenancy are generally enforceable in all states. Leases for a year or more, however, generally must be in writing. Why is an oral rental agreement hard to enforce? Unfortunately, oral agreements can be difficult to enforce because there may be limited proof of the terms of the lease. This problem could persist even if you decide to take the dispute to court. This does not mean, however, that you cannot go to court and prove to a judge that you had an oral agreement. In fact, assuming that you had accepted rent from this tenant for one month or more this may be sufficient proof that the verbal agreement was a legal agreement and your renter understood the rental terms. Can I file in small claims court? The first step to getting your money is to talk to the renter. If that fails, you will need to send a demand letter outlining your expectation for payment. If they still refuse payment you need to notify them that you intend to sue them in small claims court. Small claims courts only hear cases which are under a specified dollar amount. Assuming the rental payment amount is within the specified range (which is generally under $5,000 but varies by state), you may be able to file a case without legal help. So how do you prove your case in small claims court? You will have to provide sufficient evidence to prove that you had a verbal contract and that each party understood the terms of the verbal agreement. Unfortunately, what you do not want is for the case to rest on a he said/she said scenario where your word is pitted against that of the tenants. You case can be strengthened in several ways. For example, if a witness was present when the contract was made or if you and the tenant signed and dated any type of document which identified the key points of the agreement this can significantly help your case. Other evidence that you can provide to the court can include information or documentation which establishes the date of tenancy, the amount of the rent, the date the rent was due, and the terms of the lease can also strengthen your case and help prove that your renter knew the terms of the lease agreement. Failing any type of witness or documentation, however, just the fact that you accepted rent money for several months and the tenant took possession of the dwelling unit may be sufficient to prove that a rental agreement existed.